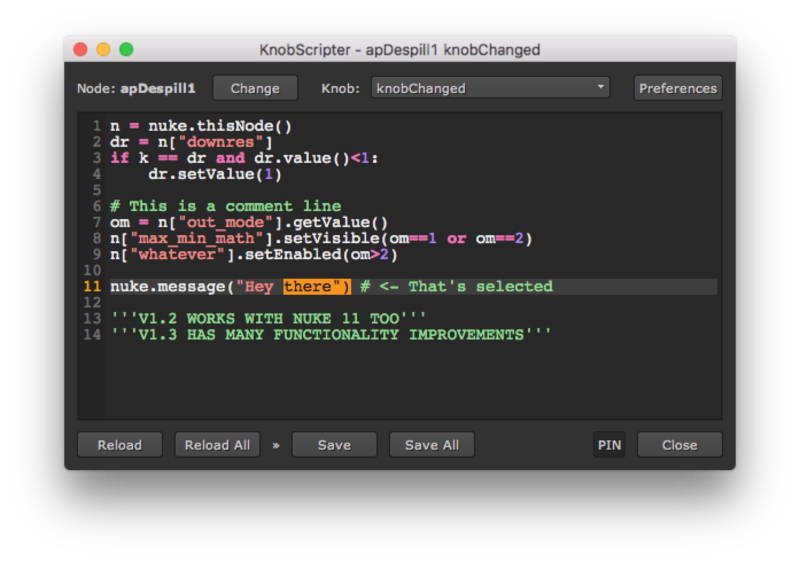 KnobScripter is a nuke script editor panel to script on callback (knobChanged, onCreate, ...) or python knobs (Python script buttons or Python Custom Knobs). It works as a floating panel to be called on a selected node, and/or as a dockable pane. Callback knobs are usually hidden so normally you'd have to bring them in order to be able to script on them. Python knobs accessed through Nuke's 'Manage User Knobs...' panel won't let you interact with the rest of the program, like seeing the name of other knobs or just testing the button without closing the scripting interface. For adding more complex scripts to the knobs I always missed line numbers or syntax highlighting. Once installed, just select a node and press alt+z, or Edit/Node/Open Floating Knob Scripter. You can also add it as a Pane (Windows/Custom/Knob Scripter). 1. Copy the included knob_scripter.py file inside of your ~/.nuke folder. 2. Inside your ~/.nuke folder, open menu.py with any text editor, or create it if it doesn't exist. 4: Restart Nuke, and you should now have knob_scripter installed. Change button can now switch to nodes inside of groups and viceversa. Knob dropdown list now displays the knob’s name and label in parentheses. PIN toggle button, to make the Knobscripter stay above all other windows or not. Scroll position on the script editor is remembered when you switch back and forth between knobs. Preferences: Change the number of spaces created with the tab key (2 or 4) and the PIN button’s default state On or Off. Bugs and suggestions are appreciated. Happy scripting! Very good work ! this is awesome ! Thank you Adrian for sharing! Awesome tool! Thank you Adrian, very useful! It's now updated to PySide2 and should work in both Nuke 11 and previous versions Let me know if you experience any problems! Hi Adrian! it does Work! I will comment you if it shows something problem. I just found this and this is awesome!!! Thanks Adrian! This is awesome! Super useful tool which I will be immediately adding to my .nuke config. I have one feature request: I often add knobChanged code to nodes within a group, so that I can avoid having the knobChanged fire whenever the selection state or position of a gizmo changes. This improves performance especially in big nuke scripts. Right now in the tool it is possible to select a node inside a group and press alt+z to load the editor, but it's not possible to press the "Change" button and switch to a node insideo a group. Would this be possible to add? Hey Jed, thanks for your feedback. This is now fixed in v1.3. Let me know if you encounter any other weird behaviours!